When the kangaroo teacher is looking up from the piece of paper, she looks like shes swallowed her mouth. That is her twisted frown of skepticism. Also good thing is that Mutual Aid among many species, including humans functions better than the Predator on Prey cycle mostly used by psychopaths to support their lifestyle. 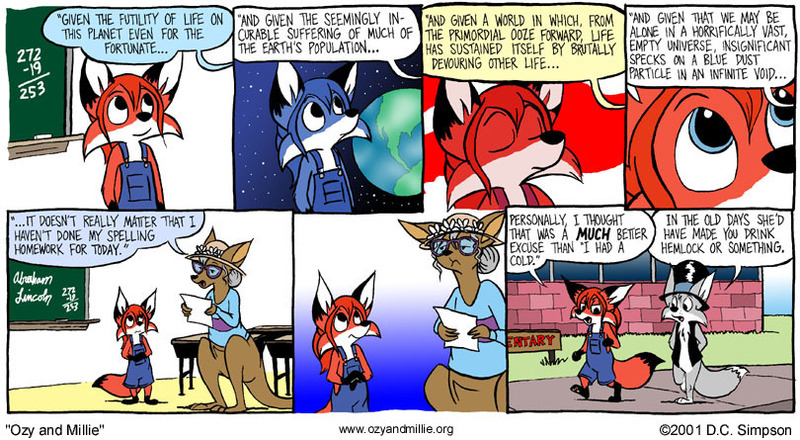 I did not realize Millie had blue eyes until this strip. It’s the only time a color strip gets a big enough closeup on her face. If she spelled all of that correctly without the use of spellcheck, then spelling is not one of her weak points. Cut Millie some slack, teach. Isn’t a female kangaroo’s pouch “naughty bits”? Shouldn’t it be covered up? To be precice, the pouch contains some of the “naughty bits.” It’s how the joey gets milk without leaving the pouch. I hope it’s not creepy that I know this. You know what would have made it perfect? If Millie’d put all of the words in her spelling assignment into that excuse.